You want to make presentations that will impress people. That will make them say 'wow'. That they will talk about. They will smile when they see your creativity. When they see a remarkably different way of putting your point across. Trust me, it's not as difficult as it seems. There are many ways to make people smile. In this post I will share one such method with you. It's simple to use and free of cost. Check this example out. You are a software firm making a sales pitch to a client and your slide is on 'why should they choose you'. 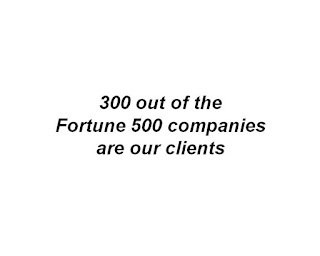 One of the reasons is: "300 out of the Fortune 500 companies are our clients". Lets see how you say that. Option #1: Plain vanilla style. This is what everyone will do. You can try saying the same thing with a few company logos. Does not highlight your point well. Option#2: You will notice the client is take aback. He is amazed and it shows up in his smile. Option #3: Similar response. 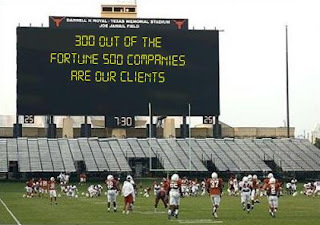 This is even better as the message makes more sense on a scoreboard than a green board. These are the 'wow moments' in your presentation. Moments that make people stand up and notice. These 'wow moments' will get remembered. Use them very infrequently to highlight something very special. How do you make such a creative slide? You don't need super creativity to do that. Check out the site Add Letters. An image and sign generation website which will give you that creative edge in every presentation you make. The above two images have been made using this site. It's very simple and very effective. I came across this site while reading a post by Jan Schultink. Thanks Jan for letting us know of this site. The only problem with these images is their resolution. They are low, hence do not stretch the images to cover the entire slide. Use it as they are. How do you find this technique? What technique do you use to highlight something special? This is an excellent post. I try to use something quite similar in some of the pitches that I have to make for selling analytics to banks. Geography specific nuances work very well like the Rugby slide above. Keep up the good work. Tweaking a presentation to suit your audience is always beneficial. Present it to audience the way they relate better. In order to do this you need to know the audience well. Keep sharing other things you are trying in your presentations. Gives all of us an opportunity to learn from your experiences.